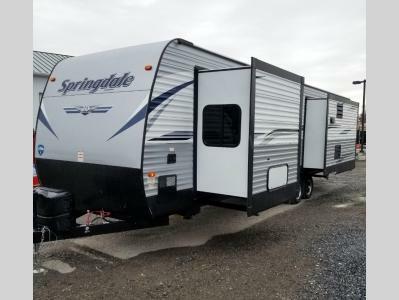 This Keystone Springdale 333RE travel trailer features three slide outs! There are two opposing slide outs in the living and kitchen area which allows for an open floor plan. There is a kitchen island with extra counter and storage space so you can prepare food and clean up easily. The theatre seating along the curbside and the sofa along the rear wall are perfect for relaxing, playing games, or chatting late into the night! The walk-through bath makes those late night trips to the bathroom more convenient. 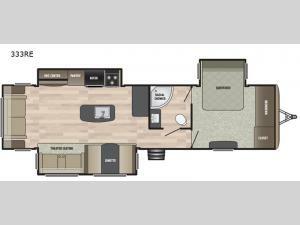 When you're ready to hit the sack, you can head into the front private bedroom and enjoy a good night's rest in the queen bed.